2015 has been an incredible year complete with ups and downs, wonderful surprises and experiences; just like any other year, right… NO not really! We went into 2015 very sad due to the passing of my mother-in-law. Our day jobs kept us busy as did our adorable Luna (Bichon Frise dog) and we plugged along. I pitched a new product line to our company President right before the holidays and returned to work in 2015 to the good news of a promotion and it being accepted and now I was the product owner and given the green light to move forward…. along with a strict revenue target. So, work got even busier but this was a dream opportunity. Fast forward to April. I can recall the events that transpired that weekend so perfectly. I was sitting with my husband Saturday evening saying how I wished I could find a pretty dress and some skirts and sharing the angst of how dreaded a trip to the local mall was because all the clothes look like rags or, to fit my curves a dress would be so ill fitting that I rather not go through the disappointment and frustration of shopping at the mall. So, hubby being the sweet caring husband he is says to me “have you heard of Pinup Girl Clothing, I bet you’d look great in their clothes”. It was the Viva Las Vegas 18 weekend and all over social media were posts from all the many Pinup dolls and their incredible outfits and styles. 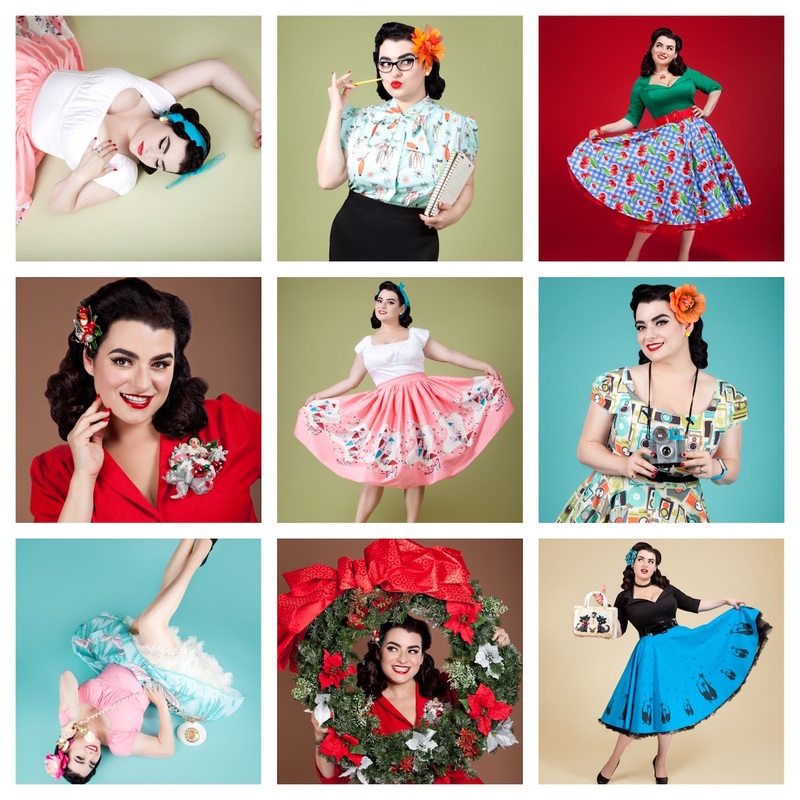 I quickly went to www.pinupgirlclothing.com and spent over an hour looking on the website and getting familiar with these spectacular clothes. I took a chance and placed an order (Birdie blue dress w/ yellow flowers, Flamenco skirt, a pink Lauren top and a Angelique Noire black dress), a Pinup was born that night!! I was embracing this new look and style and feeling so good about myself that I decided it was time, time to begin using my real name of Yasmina Greco and not just my online name of Crazy4Me and I started an Instagram account. This was a HUGE super big deal for me…. I had my Etsy and eBay stores where I sell antiques and collectibles but this was really putting myself out there and honestly, after all the horror stories about bullying and people being rude and body shaming, I was not sure what to expect. I had lived for years without a social presence. The public reaction to my photos was so positive and literally a dream. WOW, never would I have thought my pictures would trigger such a positive response. Clothing manufacturers have been unbelievably great and I have modeled for them and am on their websites and social feeds and promos so thank you to Heart of Haute, Pigtails and Pirates, Hell Bunny, and The Oblong Box Shop to name my standout favorites. The ultimate was having Pinup Girl Clothing post my pic on their Instagram feed…. Wow – dreams do come true. 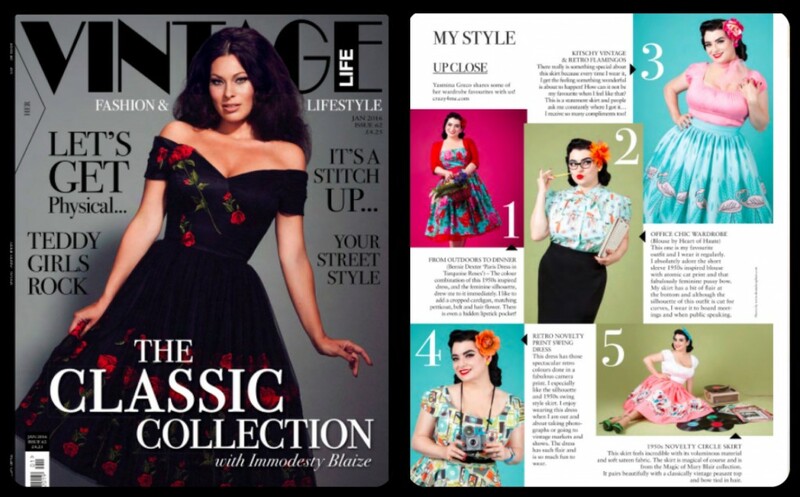 I have been featured in Vintage Affair Magazine’s Fall 2015 issue and tonight as I am writing this post the new January 2016 issue of Vintage Life Magazine is out and they have an awesome spread of me in my pinup outfits. 2015 ends with my having entered the Viva Las Vegas 19 Pinup Contest and my jetting to a ‘top secret’ photo-shoot in a couple days that I will share details about as soon as I am able to. OMG!!! So, 2015 had its share of ups and downs and everything in between but from that particular day in April when I discovered for the very first time what Pinup was and began to embrace it wholeheartedly, a Pinup Girl was born!! I am awestruck at the opportunities that have come way. For 2016 I want to take my message of possessiveness, motivation and encouraging women, girls and the youth of today through my public speaking so, I will soon share my speaking schedule with you all. I want to sincerely thank all my loyal blog readers, followers and fans for all the support these many years!! I wish for you all a 2016 filled with happiness, good health, and lots of wonderful opportunities!! Happy New Year!